Through utilising the latest developments in digital imaging and scientific analysis our project aims to understand the human victims of the eruption of Mt Vesuvius in AD 79. There is a long tradition of superimposing lives and personalities onto these victims of a mass disaster on the basis of circumstantial and presumptive evidence. The Pompeii Casts Project sets out to challenge these myths and discover what can actually be known about these victims, ensuring throughout the process that we give these people the respect they deserve as humans who were killed in a tragedy nearly 2000 years ago. Our team, based at the University of Sydney, draws on the expertise of many specialists from around the world to image and study the plaster casts and encased remains uncovered at Pompeii. To date the archaeological investigations of the ancient town have recorded over 1000 victims with 103 casts made during the excavation process. Throughout this project we will X-Ray and CT scan targeted plaster casts, undertake analysis on the still encased remains where possible, and document the casts as artefacts themselves of late nineteenth and early twentieth century archaeological practice. ​As with all archaeological investigations our methodologies and aims will grow and develop along with the finds we make. To join us on this exciting process follow our research blog and get involved with comments and questions. Keep up to date with all the latest research from the Pompeii Casts Project via our blog. Our team of scientists, archaeologists, historians and students will be contributing posts on the progress of our work, all the latest news and documentaries, interesting anecdotes from behind the scenes and resources for teaching Roman history. Assc. 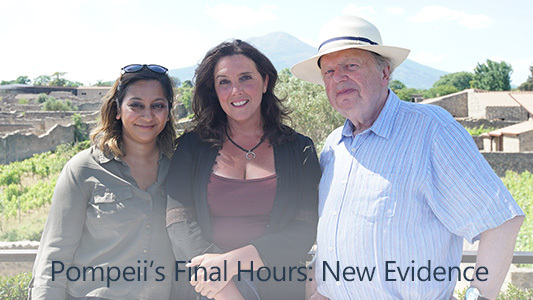 Prof. Kathryn Welch reports from Pompeii on the latest from the plaster cast project. Read here. This project would not be possible without the ongoing collaboration and support from the Director General of the Pompeii Archaeological Park, Professor Massimo Osanna, and his colleagues. We would like to acknowledge the generous support of Philips, who provide the technical expertise and access to CT scanners in our 2015 and 2017 investigative seasons. This research was partly funded by Lion TV, the BBC, the Smithsonian Channel, Arte and Voltage TV. We would also like to acknowledge the continued support of Academy Travel.